Laurel Clark (born as Laurel Blair Salton Clark in Ames, Iowa, U.S., died in Texas, U.S.) was a famous Astronaut from USA, who lived between March 10, 1961 and February 1, 2003. She became 41 years old. 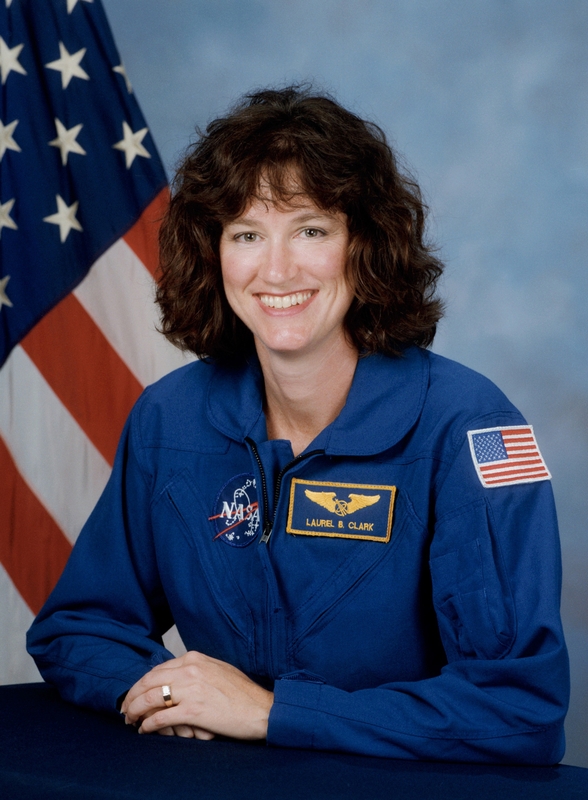 Dr. Laurel Blair Salton Clark was an American physician, captain of the U.S. Navy, and astronaut. She was one of the seven astronauts who perished during the tragic Columbia accident in 2003. She was selected as an astronaut in 1996 as part of "The NASA group 16", or The Sardines as they were called. She is born under the zodiac pisces, who is known for Fluctuation, Depth, Imagination, Reactive, Indecisive. Our collection contains 29 quotes who is written / told by Laurel, under the main topic Travel. "This has been a great experience for me. The first couple of days you don't always feel too well. You adjust to the fluid shifting, how to fly through space without hitting things or anybody else. But then you get in a groove"
"Things are going very smoothly. As expected, there are some minor glitches, and the eight minutes that it took us to get to orbit, we trained months and months for, and didn't have to use any of that preparation, other than being aware and ready"
"There's a lot of different things that we do during life that could personally harm us and I choose not to stop doing those things"
"There was a moth in there, and it still had its wings crumpled up, and it was just starting to pump its wings up. Life continues in lots of places, and life is a magical thing"
"When you talk to crews that went to Mir or have gone up to International Space Station, they say that you go through different phases of adaptation or getting used to the space environment"
"We're looking at Earth science, observing our planet. Also space science, looking at the ozone in the atmosphere around our Earth. Also looking at life science. And on a human level, using ourselves as test subjects"
"We'd like to have immediate answers to all of our questions. I think medicine in particular. I found it frustrating as a physician sometimes to not be able to tell someone exactly why something was happening to them. There are still so many mysteries in medicine"
"We trained for a lot more malfunctions than any ever happen"
"We've had such thorough training, we've had an excellent team on the ground. With the minor glitches that have occurred, we've been able to take care of them. And the teams on the ground are getting tons of incredible data"
"I feel blessed to be here representing our country and carrying out th research of scientists around the world... I hope you could feel the positive energy that beamed to the whole planet as we glided over"
"I can't think of anything that's as exciting as I'm sure this mission will be, and actually being in space. But, we did some training as a crew together"
"I can't think of anything specific growing up that pointed me toward NASA at all. I was interested in the Moon landings just about the same as everyone else of my generation. But I never really thought about being an astronaut or working in space myself"
"Hello from above our magnificent planet Earth"
"Gravity pulls our bodily fluids down, like water in a glass goes to the bottom part of a glass. In space, the water doesn't stay in the bottom of the glass. It distributes itself evenly over time throughout the entire volume of the glass"
"Gravity is one variable in a lot of scientific processes. If you can remove gravity or minimize its effect, then you can understand the other processes that are going on"
"Everyone that I've talked to who's been to space has thoroughly enjoyed the experience, and what you often hear them say is: It was great, but we just had to come home"
"Certainly my parents were a huge influence. They always expected the most out of all of us. And expected us to do our very best. I'm thankful to them for allowing me to do what I wanted to do"
"As a physician, I understand how important it is to collect data on people so we can understand what's happening with them. I will be in the position to help enable that knowledge"
"There are some very significant changes in the way the fluids are distributed in our body, the way our heart functions initially, and as well as our bone and muscle"
"The Navy's paid for you to go through school, and then they need doctors to go out and take care of people who are in various different parts of the world. I decided to pay back my time first as an undersea medical officer. I was stationed in Scotland"
"The microgravity or the very, very low amount of gravity that we have up in space forces some changes in different processes. It forces changes in us as human beings"
"Some things are only capable of being done in space. Examples of that are looking at our Earth from that far away, and understanding the entire processes of storms and weather patterns, and oceans, and coastlines"
"Science, for hundreds of years, has spanned the differences between cultures and between countries"
"Other than motherhood, the eight years that I spent at the University of Wisconsin, Madison, I have incredibly fond memories of. It's a beautiful place, with four seasons up in Wisconsin. And really wonderful people"
"Life science research can be done on multiple platforms. Since we have a very small number of people flying into space, the more people you have, the better"
"It's such a long mission and we get to spend so much time in space... we're doing such exciting research. And I don't want to overemphasize the life science research, but as a physician the life science research that we're doing is extremely exciting"
"If you're trying to get someone who's sick with a fever off of a submarine and it's cold and raining outside, the only way in and out of a submarine, generally, is through a fairly narrow hatch"
"I've always enjoyed traveling and having experience with different cultures and different people. But it's also a wonderful thing to be able to benefit and enable research, not only in our country but around the world"
"I have a computer screen near my seat where I monitor the overall health of the vehicle and pick up any problems that might be occurring early on or once we see any kind of a malfunction or anything unusual that's happening, we can look at the data and figure out what that is"